I was wondering if anyone's had experiences flying with young kids on their lap. We're going to have to be making a cross country trip next month kind of unexpectedly, and will be bringing our 3 1/2 month old daughter. I know airlines allow you to carry a baby on your lap, which we were planning to do. In asking about flights on another parent group thing, I got feedback about how unsafe this is, and how it's much better to buy a seat for her and have her in her car seat during the flight. Now I feel a bit torn about this. Realistically, I don't know if we could afford the seat for her (tickets aren't cheap, especially so last minute-ish). And, I know it is obviously safer to have her in her seat on the plane, versus checking her seat/having her on our lap. Though, again, I don't know how feasible it would be to do this. Does anyone have any experience? Am I being a bad mom for thinking about doing what is more affordable/realistic versus the utmost safety? Re: Flying with infant on lap? In my opinion if a plane is going to go down I would think chances of survival are not much different seat or no seat. We are doing this in a month also. I would only say the seat is safer re: turbulence. 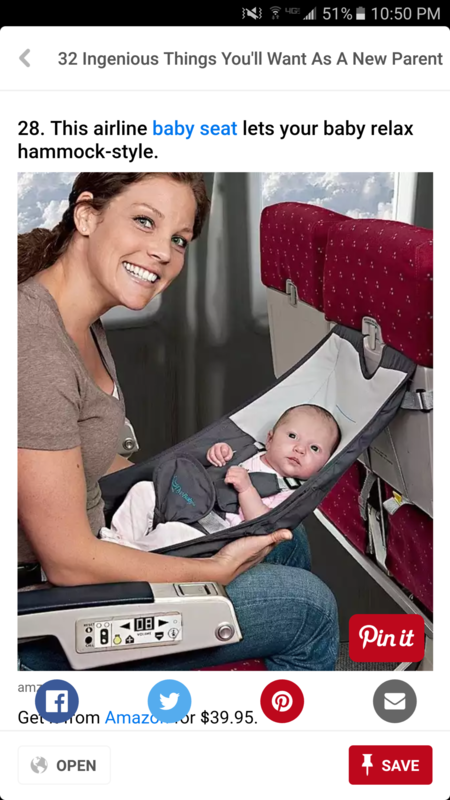 If the fasten seatbelt sign is on maybe you can have her in a carrier so she is a bit more strapped to you. But extremely dangerous turbulence drops are pretty rare. I'm going to hold him most likely. Plus he will need to breastfeed so it's not even that practical to have him in the car seat. In the event of a true emergency landing a car seat will mean precious seconds to get baby out too. I'd hold LO as well. If yours is like mine, the car seat is hated. LO puts up with it for short stretches, but gets upset and will scream until held. Just not worth it if you'll be holding LO all the time anyway. Thank you for the feedback! I've been hearing from others that this is a safe enough option. So I think we'll end up doing that. Not sure if this is an option? I just did this. Keep her in your lap. She will feel safer being close to you since its a totally new experience. That hammock thing is funny, and clever. And thanks for the feedback about your experience. It seems like I'm hearing from many people that laps have been successful. And she does usually seem comfortable with my husband or me holding her. Thanks everyone. We flew with DS1 a number of times as a lap baby from 6 or 7 months until 2 years old and plan to do the same with DS2. Even after he turned 2 and was required to have his own seat, he never stayed in it very long and climbed on our laps most of the flight. We never bothered with the car seat because of the costs and the hassle and because he wouldn't stay in it anyway. I know some parents though that bring on a car seat for their older babies/toddlers because the kids are used to sitting and napping in one for long drives and that association transfers over to sitting nicely and napping on flights. Using a car seat would be a safer under the circumstances where it would be hard to hold onto your baby tight, but it's a calculated risk. Plane crashes and extreme turbulence are very rare and in case of a crash, the car seat improves survival odds a very small amount. You have to make the choice to take that risk or not for yourself, since it's not a big enough risk for airlines or governments to require car seats on planes by law. I just got home from a cross country trip with DS who is 3 1/2 months old. He did great in my lap on all four flights. Make sure you nurse/bottle feed/give pacifier on take off and landing and LO will be fine. I think the noise of the plane helped keep DS asleep. Thanks everyone for the feedback! We had 4 successful flights with her on our lap/partly in the carrier.